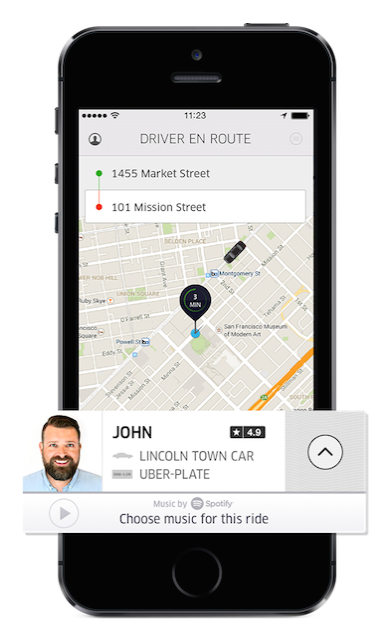 Uber now lets you play backseat DJ for your car’s sound system via Spotify in 10 cities. On my demo ride-along, I was impressed by how easy and seamless it works, as long as the driver is equipped. Music selections made on your phone quickly start playing through the driver’s app connected to the stereo, and there’s no data cost to the passenger beyond the premium Spotify subscription. The integration demonstrates both how Uber could allow more in-car personalization and control, as well as how Spotify could strengthen the value of its paid subscriptions through an ecosystem of third-party apps. Obviously, the partnership comes at a tough time for Spotify, as no one would want to tie their brand to Uber right now given the scandal around one of its execs suggesting the company dig up dirt on journalists who criticize it. But beyond that, the deal makes sense as both companies are trying to change how you spend money by touting convenience. Spotify tells me the Uber integration will roll out globally in the next few months, but is now live in 10 cities: London, Sydney, Singapore, Stockholm ,Mexico City, Toronto, NYC, LA, SF, and Nashville. Uber is aggressively trying to get all its drivers equipped to run Spotify, and teach them how the system works. Until then, perhaps the worst part of the integration is that not all drivers have it, and you won’t know if your driver does until they confirm you ride. That could lead passengers to cancel on drivers without Spotify if they were really hoping to rock out. This problem will solve itself with time, though. Here’s my hands-on video, that I stupidly shot in portrait mode. Feel free to make fun of me on Twitter at @JoshConstine. To use Spotify in Uber, you go into your Uber app’s profile page and “Connect Spotify” to your $10 a month premium subscription. Once you request a ride and are assigned a driver, if they have Spotify set up you’ll see a Music bar at the bottom of the Uber screen. Tapping that gives you quick access to your own Spotify playlists or a set of city-specific playlists that feature great driving jams. Once you select a song, it will go into a holding pattern until your driver presses the Uber button to start the ride. Their phone will immediately start playing the song through the car’s system. This works nicely so the second you get in the car, you have control of the soundtrack. While riding, you can choose different songs at any time, and they only take about one to two seconds to start playing in the car, which feels very snappy. Overall, Spotify + Uber feels like a natural, graceful collaboration. It’s not sluggish, confusing, or limiting in terms of music choice — all ways they could have screwed it up. One of the big complaints ride-sharing services sometimes get is that drivers are too chatty when passengers want a quiet ride. It sure won’t be silent, but at least now you can ride in peace with a cabin full of your favorite jams instead of small talk.